Halloween night, and the dead are closer than ever for Dr Ruth Galloway. She is used to long-dead bodies, but a fresh corpse in the middle of a museum is a new challenge. It is Halloween in King's Lynn, and forensic archaeologist Dr Ruth Galloway is attending a strange event at the local history museum - the opening of a coffin containing the bones of a medieval bishop. But then Ruth finds the body of the museum's curator lying beside the coffin. Soon the museum's wealthy owner lies dead in his stables too. These two deaths could be from natural causes but DCI Harry Nelson isn't convinced, and it is only a matter of time before Ruth and Nelson cross paths once more. When threatening letters come to light, events take an even more sinister turn. But as Ruth's friends become involved, where will her loyalties lie? As her convictions are tested, she and Nelson must discover how Aboriginal skulls, drug smuggling and the Aboriginal ritual of The Dreaming may hold the answer to these deaths - and be the key to their own survival. Another thrilling installment in the Ruth Galloway mysteries. 5.0 out of 5 starsMore folk in Norfolk! Dr Ruth Galloway is a heroine worth following! I seem to have bought and read four of her tales and will get around to the rest when I can afford them! 3.0 out of 5 starsEnjoyable but not to the standard of the previous 3 books. I didn’t find the story as engaging this time. Two stories running concurrently that I found confusing and worse not very interesting nor intriguing. Another great read in this series. I loved it, could not put it down. The whole concept of this ongoing saga is very compelling. I love the central character and her muddled life, she feels very real. Loved it. Hooked on Dr Ruth Galloway and Nelson. Another good read in this series. 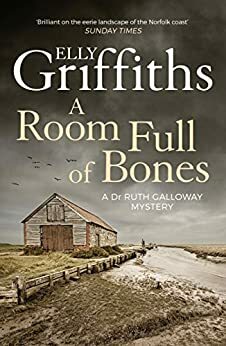 I am enjoying reading the Ruth Galloway series, you wouldn't think archaeology could be so dangerous.